Even the apocalypse is a process that takes time. Like a financial crash that isn’t really a condensed all-at-once occurrence, the retail industry’s long-described reset has for another year reached even greater proportions in 2018. It’s not clear when the term first showed up, but by now it is a mainstream staple. No article on the state of retailers is complete without the term Retail Apocalypse. Many, if not most, attribute the sad state of affairs to Amazon (NASDAQ:AMZN). Consumer preferences have finally changed. Warnings issued all the way back in the dot-com era about the death of “brick-and-mortar” operations are finally coming true. Crashes don’t happen all at once, most of the time they take an immense amount of time. There is no doubt that online and virtual shopping is a key factor in the ongoing transformation. But I don’t believe it can account for the proportions that are being described. In all of 2017, according to CoreSight Research, there were 6,995 store closings announced (an imprecise and heterogeneous measure of distress, but an aggregate one nonetheless). That number surpassed even 2008’s previous record. Through the week of June 8, 2018, CoreSight notes 4,123 planned closings. 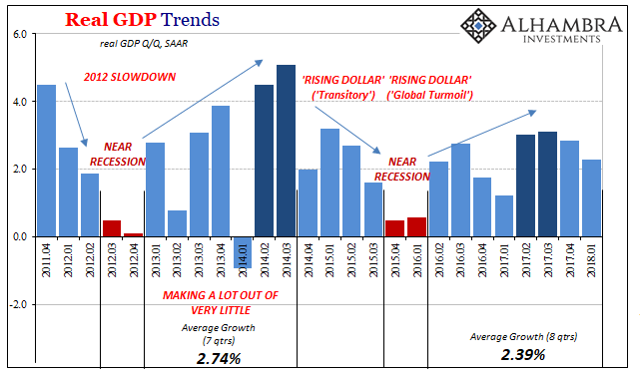 This year is on pace to surpass last year’s record, assuming things hold up as they are now. This is surprising to most people, because in conventional terms the economy is supposedly doing quite well. Unemployment is at a multi-decade low, consumer confidence is sky-high, and there isn’t a day that goes by where the words “strong,” “robust,” and “booming” aren’t used in mass proportions. Thus, it must be Amazon. The US Census Bureau is the part of the Commerce Department charged with, obviously, conducting the US Census. Article 1, Section 2 of the US Constitution mandates government counting. Additional demographic data has been added over the centuries, but in the 20th century, this piece of the bureaucracy really came into its own. The Bureau has become an indispensable part of the economic landscape. One reason for that is the agency has the power to compel participation in its various activities. On matters that have nothing to do with the official Census, the Census Bureau can mandate a business respond to its several possible requests for information, each with the force of government, and possible penalty, behind them. In truth, the Census Bureau should be renamed the Survey Bureau for these reasons. Its compulsion means that it gathers more data than any private source (except for Big Data places like Google and Facebook). Among the many surveys in its arsenal is a little-known supplement to the Economic Census. Every year, the agency conducts the Annual Capital Expenditures Survey, or ACES. As with most others, participation is mandatory under US Code, Title 13. Making up the survey are 50,000 businesses with paid employees pulled from the Business Register, including all which employ more than 500 workers. An additional 20,000-strong sample is generated from among nonemployer firms. As the name proposes, the purpose is to obtain information about capital expenditures. Dating back to 1994, these estimates are further broken down according to business size as well as by industry (noting some classification changes over the years). 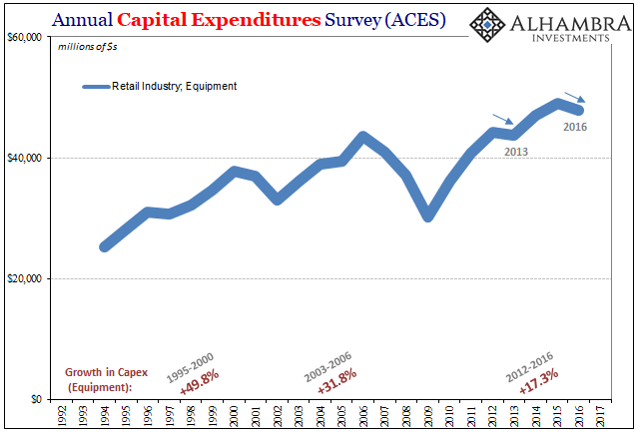 That means we have pretty comprehensive figures about how the retail industry, in particular, has been investing in its productive, or unproductive, capacities through almost a quarter century. Capital expenditures, according to ACES, are classified as either relating to equipment or relating to structures (including the refurbishment of existing buildings). What stands out in the first segment, equipment, is that the retail industry appears to have spent less in 2016 (the latest data) than in 2015.